In order to perform calculations in Angle, you need to specify a number of parameters for the specific measurement. The process usually starts with entry of the data defining the detector, container and geometry used for calculation. Real numbers can be entered in exponential form. For example, 5.43 · 10-3 can be entered in two ways: as 0.00543 or 5.43E-3. This is very useful when entering very small numbers, for example 1E-7 (1 · 10-7) is more convenient than 0.0000001. When entering the data, you can move from one text field to another by mouse click or by pressing either the Tab or Enter key. This way you can enter values much faster, especially when using the numeric keyboard. By pressing the Enter key, while the cursor is in the last field of one group/tab (e.g. Contact pin material field in the Detector tab), the next tab will be displayed automatically, so that data entry can be continued without the need to select the next tab and data field by mouse. Thus, pressing the Enter key after each data entry is the easiest way to continue entering and/or editing data. During data entry the currently selected field is emphasized with a light blue background. All fields representing units of length are trailed by the unit abbreviation (e.g. “mm”). This helps avoid making wrong entries in cases when dimension units are changed. You can change the units of length in the configuration dialog box. To open it, click on the “Configure ANGLE 4” button, which you can find under the “File” and “Help” ribbon tabs. 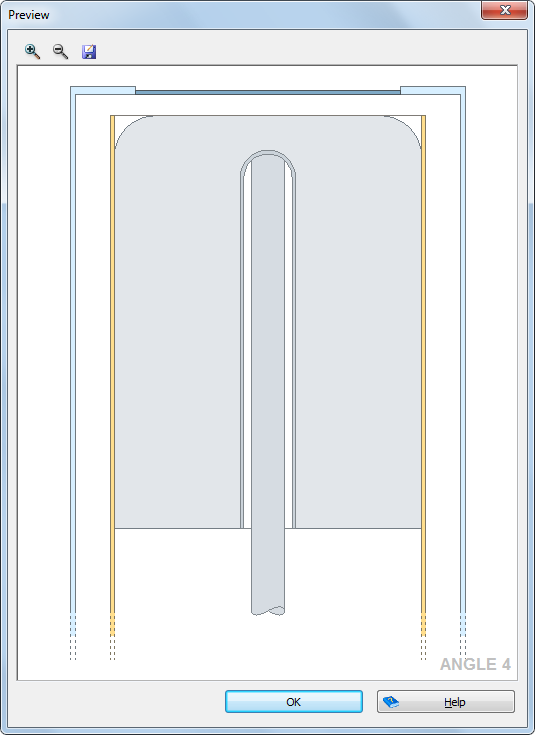 The windows for detector, container or geometry parameters entry show schematic drawings on the right-hand side. These drawings are very helpful during the data input process. While you are entering certain dimensions, a red dimension line is displayed on the illustration indicating the required parameter (see the next figure). This visual aid is very important both to help you enter the data faster and to avoid errors. The terminology used by different manufacturers is different and sometimes even ambiguous. Thus, keeping an eye on the illustration markings during data entry is advisable to understand the terminology used in Angle and to avoid mistakes. Materials (material’s chemical composition) of certain construction elements can be selected from the appropriate drop-down list. This list contains the most common materials for the given parameter. For example, when choosing the material for a detector end-cap, Aluminium, Magnesium and Carbon fiber are offered as the most common materials for it. If the desired material is not in the list, click on the “Something else...” item in the drop-down list, and you will be able to define any material, as long as you know its composition. You can find more details about defining new materials later, in the Custom materials section. One of important new features of Angle 4 is the preview option. Through this you can see a scaled image of the detectors, containers, geometries and even complete counting arrangements. You can see the preview image by choosing some of several preview options on the ribbon, or pop-up menus, and while entering or changing the parameters for detector, container or geometry. The next figure shows the preview window of one detector. If the image is zoomed-in so it cannot fit the window completely, you can pan it simply by dragging it with the mouse. This way you will be able to see and examine even smaller details. The vector formats consume much less space on a disk and you can scale them without losing any quality. They are an ideal choice for printing. You can even import them to vector graphics applications such as Adobe Illustrator or CorelDRAW and edit them freely. Raster images may look better on screen and other low-resolution devices, and are an ideal choice for the web. Raster images will be saved using the selected zoom factor, so the more you zoom it, the larger resulting image will be. 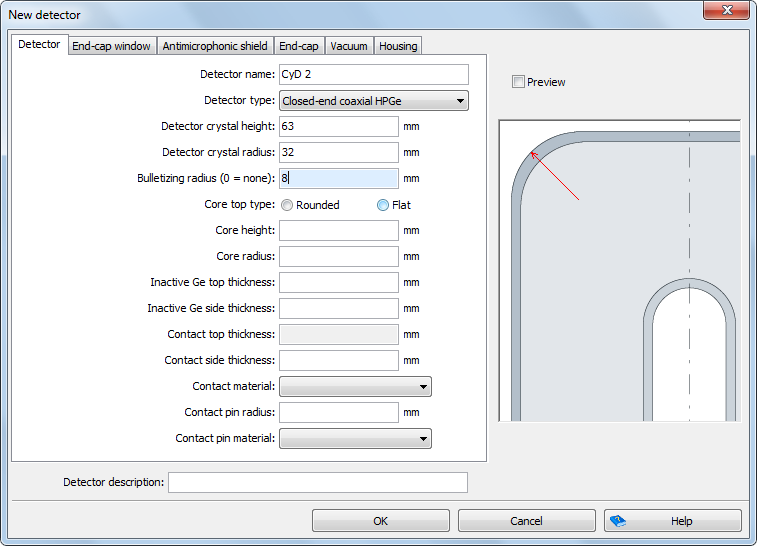 Another new feature in Angle 4 is the possibility of importing and exporting parameters for easy sharing. For example, you can export the detector parameters and import them to another computer with Angle 4 software installed, to avoid re-typing the parameters and the possible mistakes caused by this. You can use the buttons on the ribbon or options in the pop-up menus for detector, containers or geometries to select the file you are exporting to, or importing from. You can also import data from the calculation parameter files and the calculation results files, since they contain all types of parameters. From the file selection dialog, simply choose the type of file you want to import the data from. In the same way you can import parameters for detectors, containers, geometries, reference efficiency curves and energies. 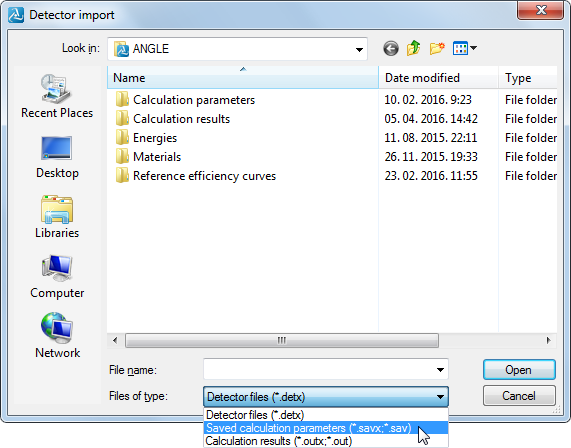 It is also possible to import data from calculation parameter files and calculation results files from the previous versions of Angle.